In a major step, Panjab University has decided to set up an institute of engineering and technology on the university campus. According to a university note, “It is planned to start courses from the forthcoming academic session (2002-2003). The help of other university teaching departments like Chemical Engineering and Technology, Computer Science, Biotechnology, Biochemistry, Biophysics, Physics and Chemistry will be taken. The City Administration has initiated the process of preparing emergency medical and rescue teams from the city to meet the exigencies of a war-like situation. 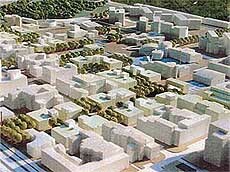 PUDA has approved the concept design for the development of the City Centre at Sector 62 in SAS Nagar. The design was approved following a presentation by Dr B.V. Doshi, a renowned Urban Planner and Designer. The presentation was held under the Chairmanship of Mr K.B.S. 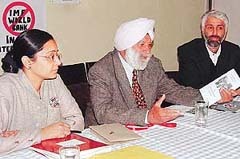 Sidhu, Chief Administrator, PUDA. A view of the concept design proposed for City Centre in Sector 62, SAS Nagar. Life returned to the college campuses in the city with colleges reopening, here today, after a week-long winter break. However, lean attendance was recorded in classes on the first day. The usual activity and hustle and bustle of college life was missing and classrooms wore a deserted look. 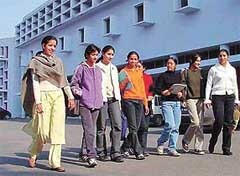 Students of GCG-11, Chandigarh, take a walk in the sun after colleges reopened on Wednesday. Under a commitment to keep the burden of taxes to a minimum, including paid parking and property tax, the Congress has decided to explore the possibilities of financial support to the Municipal Corporation from the Central government, Planning Commission and the Second Delhi Finance Commission to avoid taking harsh economic measures. 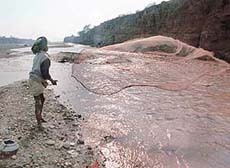 NETTING LIVELIHOOD: A fisherman puts his net into the Ghaggar to catch his daily prize as the sun, after being overpowered by clouds for nearly a week, breaks free on Wednesday. There are at least four aspirants from the ruling group for the post of senior vice-president of the Municipal Council, the election for which is to be held on January 4. Enthusiastic city youngsters turned up in large numbers to become members of the British Council Library in Sector 8 today. As many as 587 members were enrolled by 7 pm. Another 150 had to return disappointed after the library closed for the day. The queue had started to build up early in the morning. Several telephone subscribers in the city are facing a unique problem. Officially their phone numbers have been changed but in reality when a person dials the new changed number a recorded voice says ‘‘ This number does not exist.’’ And no one is addressing the problem since it surfaced four days ago. Posing as photographers hired by the Architecture Department, two unidentified middle-aged men forcibly entered the Government College for Girls in Sector 11 here today and took photographs of the college building. More than 50 employees of Mahendra Chaudhary Zoological Park organised a rally and staged a dharna besides raising slogans against the zoo management on the second consecutive day here today. 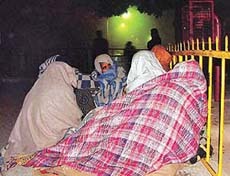 On a call given by the UT Powermen Union, employees of the electricity wing of the Engineering Department under the Chandigarh Administration today held a dharna outside the Electricity Operation Division 3, Sector 19, to protest against the Administration for its adamant attitude towards the long-pending demands of the employees. The Punjab State Pensioners Confederation today appealed to various political parties, including the Congress, the SAD, the BJP, the CPI, the CPM and the Bahujan Samaj Party, to include its 15-point charter of demands in their election manifestoes for the assembly elections to be held on February 13. The Panchkula Estate Welfare Society today said the municipal committee had started issuing house tax notices to the residents. Dr S.K. Chhabra, president of the society, said that the residents were at loss to understand the criterion the committee adopted in fixing the house tax. The local unit of the International Society for Krishna Consciousness organised an ‘initiation ceremony’ as per the Vedic system by arranging yaga and havan at Hare Krishna Dham, Sector 36-B, here, last evening, according to Bhakti Vinod Dasa Prabhu, president of the local unit of ISKCON. 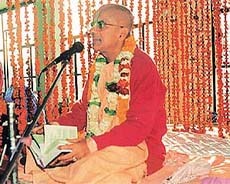 Swami Sril Gopal Krishna Goswami Bhagvadpad delivers a lecture on the occasion of ‘initiation ceremony’ at Hare Krishna Dham, Sector 36-B, Chandigarh. The bank employees in Sector 17 have opposed the decision of paid parking in Bank Square. And emergency meeting of the bank employees was held in this regard here today. Mr jagraj Singh of Janata Colony lodged an FIR with the police that he was assaulted and injured by Ranbir Singh, Rishi Pal and Joni. A case under Sections 325 and 34, IPC, has been registered against the suspects. A teacher in a local school, Ms Rinku Kalia, was robbed off her purse containing Rs 3,500, her driving licence and registration papers of her scooter (CH-01-P-7569) this afternoon. In its endeavour to sensitise the textile industry, particularly the small and medium enterprises in the decentralised sector, to the impact of WTO agreement, the Textile Committee in partnership with its sister organisations under the Ministry of Textiles, Ministry of Commerce, State governments and local trade and industrial associations, will conduct an awareness seminar in the city next month. 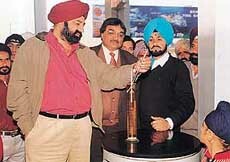 Renowned comedian Jaspal Bhatti, visited Indian Oil’s company-owned, company-operated retail outlet along with Mr M.L. Toora, Chief Divisional Manager, Indian Oil Corporation, on the New Year Day. Manager, Indian Oil Corporation Limited, at a retail outlet of the company in Chandigarh on Tuesday. The students and faculty of Global College Sector 4, Panchkula, organised a cultural evening and dance party to celebrate the New Year at Hotel Prabhat Inn last evening. Dr Shankarji Jha, Professor and a former Chairman of the Department of Sanskrit, Panjab University, was honoured by Sampoornanand Sanskrit University, Varanasi, for enlightening an all-India congregation of Advaita scholars at the week end. The Election Commission of India today filed an application in the High Court seeking the vacation of stay granted by the court while taking up petitions filed by Muktsar’s Deputy Commissioner K.J.S. Cheema, besides Kapurthala’s Deputy Commissioner Vivek Aggarwal and Amritsar’s Deputy Commissioner Narinderjit Singh. The application is likely to be heard tomorrow. An accused, Vicky, who was arrested in a case of murder, has been remanded in judicial custody till January 16 by a local court. The accused was arrested for allegedly murdering a resident of Maloya, Jaipal, in the Sector 25 Janata Colony, yesterday. Finding deficiency in the services of the Tata Engineering and Locomotive Company the UT Consumer court has directed the former to pay Rs 10, 000 as compensation to a city resident for causing harassment to him. Acting Lab, a division of DAC College imparting training in the field of IT, fashion designing, beauty care and various other job-oriented courses, had arranged the shooting of two episodes of DD-Punjabi channel, ''Lakk Marore Khave'', in association with Avnish Production. While you snug up in your quilt in your warm cosy home, spare a prayer to thank the God Almighty that none of you is attending to a dear one admitted in one of the city hospitals. Out in freezing temperatures trying desperately to keep warm huddled together in worn-out shawls, the worst place to be is probably the PGI, waiting on patients, with no money and nowhere to go without money. Justice Kuldip Singh, a former Judge of the Supreme Court, today released a book titled ‘World Bank Funded Health Care — A Death Certificate for Poor’ authored by Dr Vineeta Gupta at the Chandigarh Press Club. During his speech Justice Kuldip Singh said the forefathers of our Constitution had incorporated in the Constitution a chapter known as Directive Principles, which promised provide health care to all residents of India. Four city residents have pledged to donate their bodies after death to the cause of medicine. All four are members of the Indian Donors Club and have decided to launch a week-long awareness campaign to motivate people for this cause. Roller skating in the city might head towards a disaster, if the corrective steps to rejuvenate the working of local skating association was not taken immediately. Despite the presence of abundant facilities for skating and the recent mushrooming of rinks of national and international standards, the city skaters were not getting the desired boost. The Chandigarh Roller Skating Association is responsible for such condition of the game which for the past many years has limited its job by organising the state meet only and that too without much fanfare. Saurabh was the star player for the Goswami Ganesh Dutta Sanatan Dharma College, Sector 32, Chandigarh, when they outclassed SGGS College, Sector 26, 3-0 in the Panjab University Inter-college Tennis (men) Championship played here today on the Panjab University campus grounds.